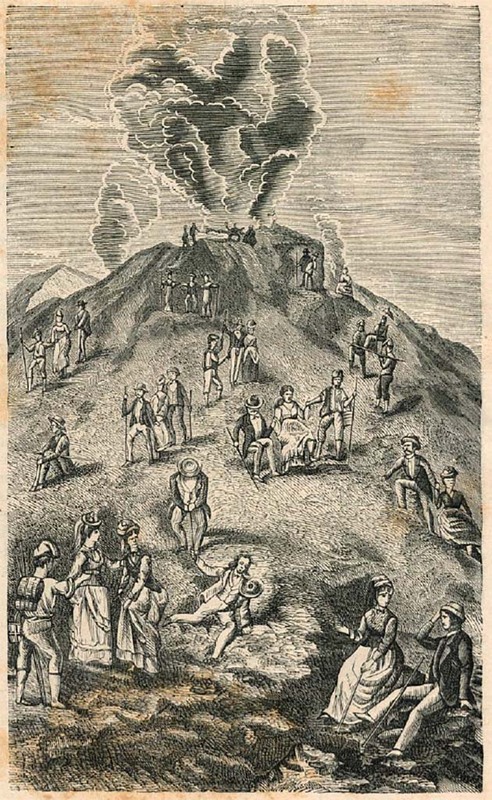 Initially Vesuvius had to be climbed on foot, on horseback or by being carried by sedan-chair. Vesuvius 1858. 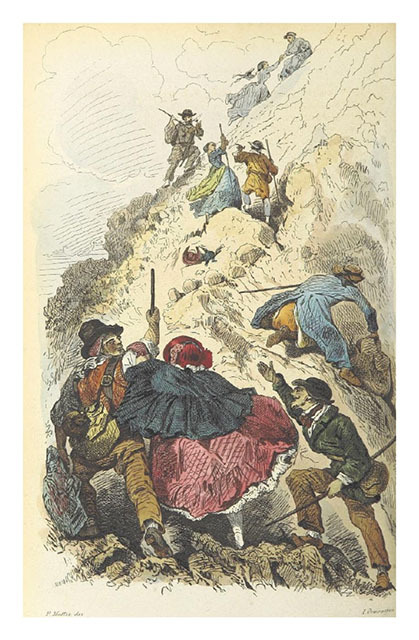 Salita al Vesuvio (Climbing Vesuvius) by P Mattei. 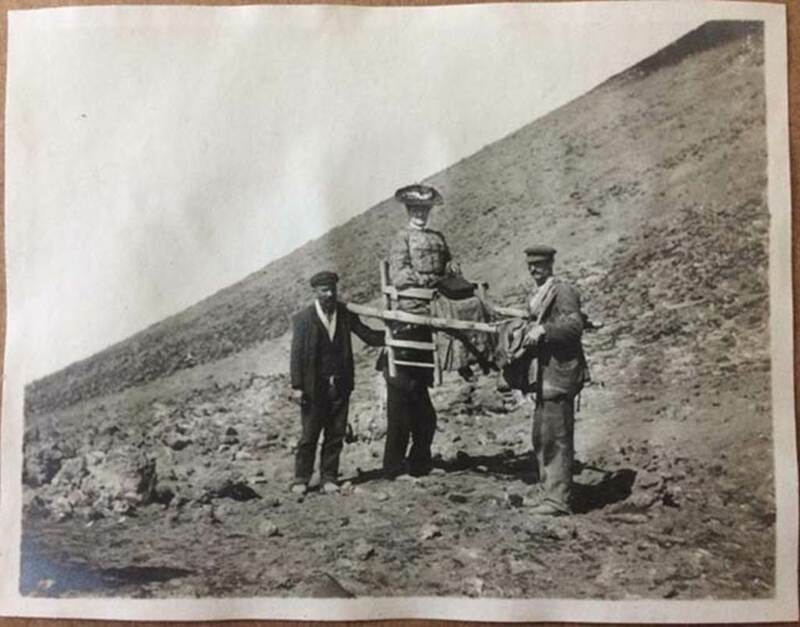 Vesuvius August 27, 1904. A tourist is carried on a sedan-chair. Before the funicular this was the most comfortable means of transport. 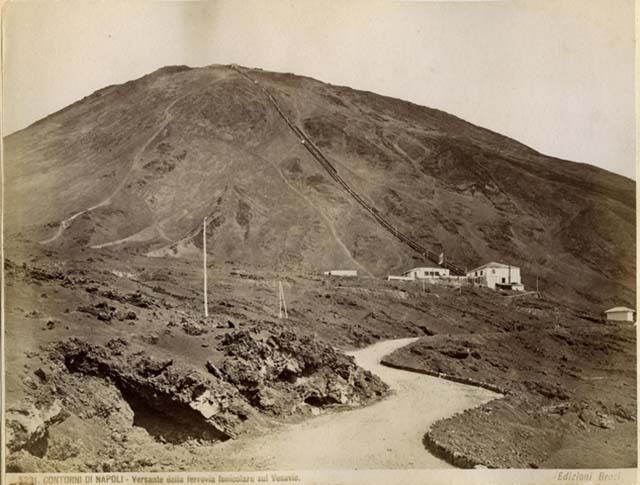 The first funicular cable car on Mount Vesuvius opened in 1880. "Funiculì, Funiculà", a famous Neapolitan language song with lyrics by journalist Peppino Turco set to music by composer Luigi Denza, commemorates its opening. It was later destroyed by the March 1944 eruption. Around 1870 the financier Ernest Emmanuel Oblieght had the idea of ​​building a funicular on Vesuvius. In 1878 he obtained land licenses and land leases for thirty years. 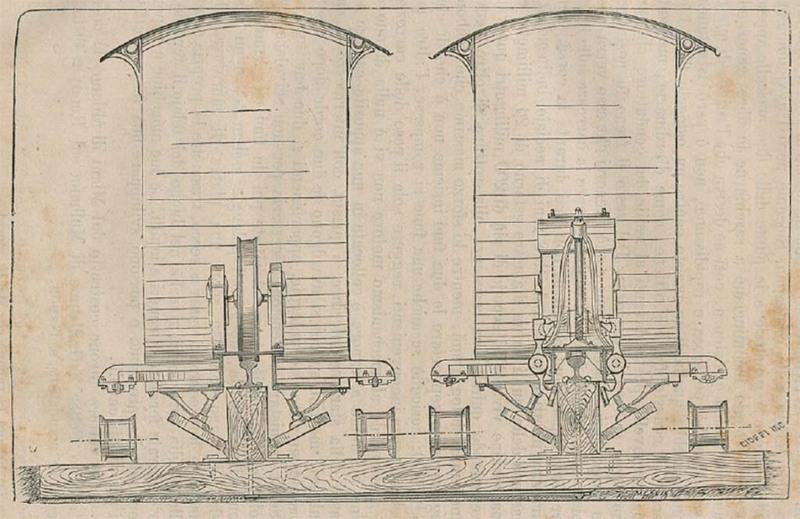 The project, drawn up by engineer Olivieri, foresaw two directions along which flowed several carriages weighing each of 5000 kg pulled by steel cables thanks to 45 hp steam engines . The cost of the work, which was completed in 1880, amounted to 435,000 lire. On May 25th, before the official inauguration, the commission for testing was held in Naples and on June 6th, around 5 pm, the Vesuvius funicular was inaugurated. Senator Piedimonte, president of the company operating the line, the mayor of Resina and the mayor of Naples took part in the toast. On 10 June the funicular, directed by Enrico Treiber, was opened to the public, thus starting the regular service. In 1886 Oblieght ceded the funicular railway, in financial difficulty, to the French Société Anonyme du Chemin de fer funiculaire du Vésuve, who in turn handed it over to the British Thomas Cook & Son two years later. 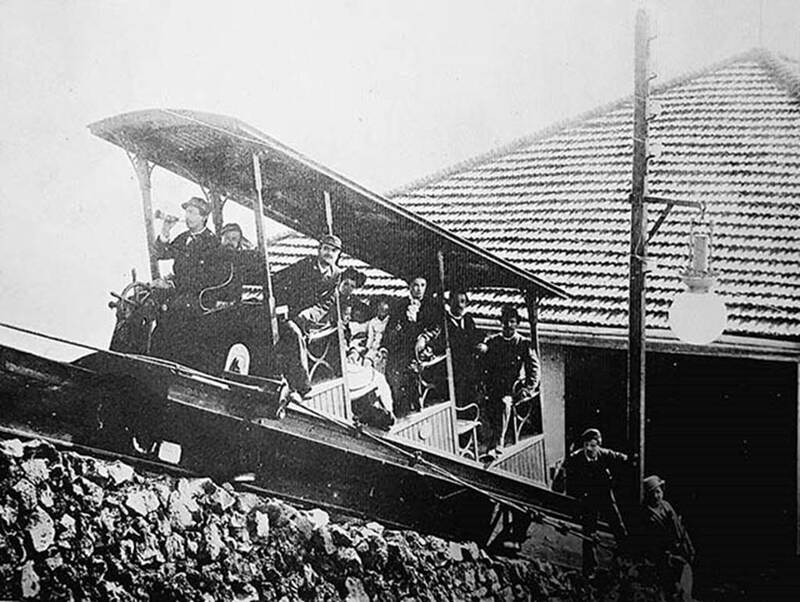 With the advent of the new company it proceeded to the renewal of the rolling stock, but also the new management continued to have little success, due to the difficult accessibility to the funicular from Naples and the pressing extortion requests of local guides, who set fire to a station, they cut the cables and pushed a carriage down the ravine. John Mason Cook, who in the meantime had succeeded his father Thomas who died in 1892, came to an agreement with the guides on the sums to be paid for each passenger transported. 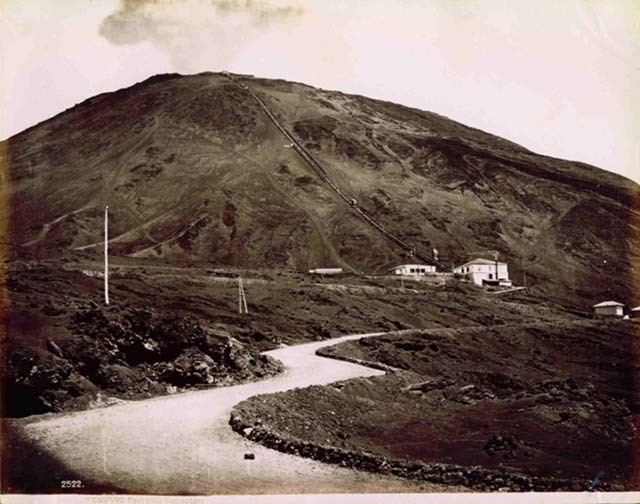 The new light railway, partly rack railway, built in 1903 on the Pugliano stretch (Resina) - San Vito - Observatory-Vesuvius (Lower Station) contributed to double the number of tourists transported to the crater, thanks to the proximity of the station di Pugliano with the Resina station of the Naples-Pompei-Poggiomarino railway. This led the company to demolish the old plants and build a new funicular, with electric motors instead of the old and expensive steam engines, single track doubling in the middle (instead of monorail); more new capacious carriages entered service. 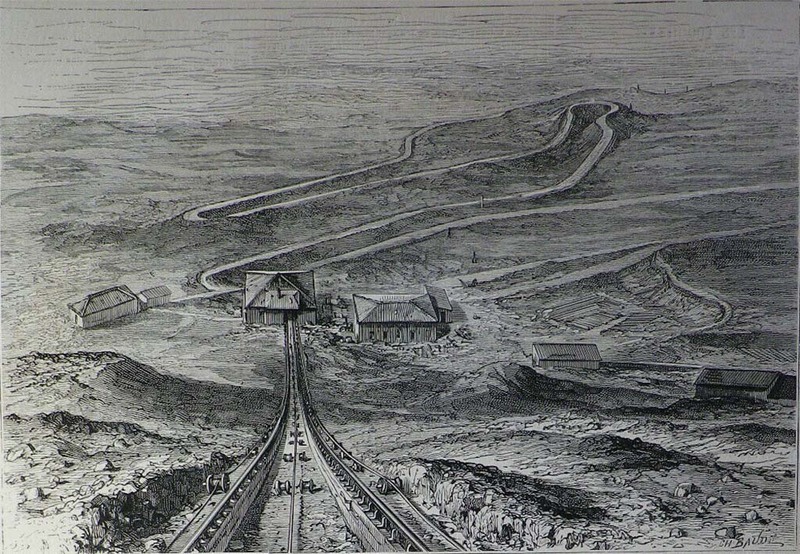 The line thus rebuilt went into operation in September 1904. But the blossoming of technology at the beginning of the century was overshadowed by a tremendous eruption, that of 1906. On 7 and 8 April the lower and upper station, the equipment, the machinery, the two funicular cars were destroyed; everything was buried under a 20-30m high ash blanket. In a short time the damages to the electric railroad were repaired, while only in 1909, according to the project of the engineer Enrico Treiber, the works for a new funicular were ended. A landslide occurred March 12, 1911 at the upper station caused a new interruption of the funicular, which reopened February 3, 1912 after retreating the mountain station of about 80 meters. 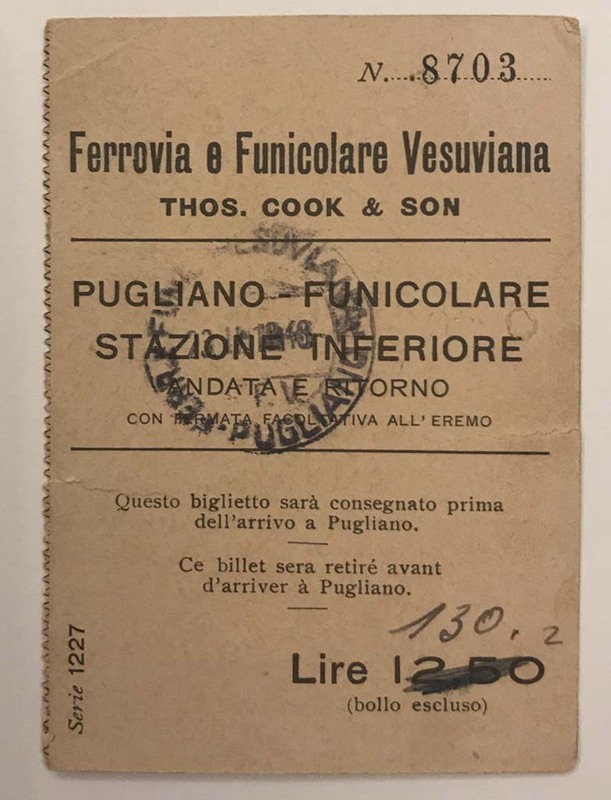 In 1927 Thomas Cook ceded the concession to the Ferrovia e funicolare vesuviana Società Anonima Italiana, a company controlled by Cook itself. The plant remained in operation until 1944, when Vesuvius erupted. The funicular, already under the control of the allies since 1943 suffered irreparable damage and was no longer rebuilt. Vesuvius Funicular. 29th November 1926 notice of meeting to discuss transfer of ownership. 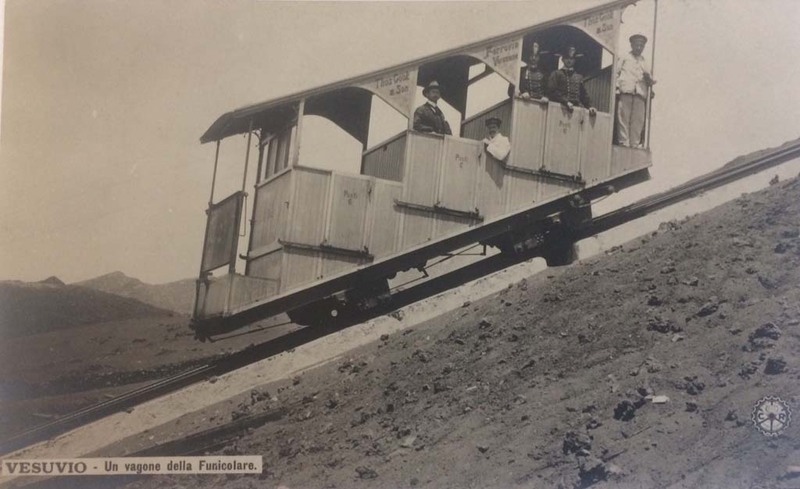 In 1902 the ascent to the lower station of the Vesuvian funicular was carried out with horse-drawn carriages, with a journey time of about 4 hours for tourists coming from Naples. The Thomas Cook Group having purchased the plant designed a railway of about 20 km taking up a previous project of the engineer Mineri dating back to 1896. It was to be a 1435 mm gauge railway, with steam traction, equipped with 7.5 km of rack rail type ABT in the section of greater slope. This project was approved and obtained concessions by the Italian government but due to high costs it was not realized. The same was however resumed in 1901 by the Strade Ferrate Secondarie Meridionali (SFSM), which operated the Naples-Ottaviano railway and wished to establish a new connection between Naples and Poggiomarino passing through Barra, Pugliano and Pompeii. This meant Thomas Cook Group only had to build the stretch from Pugliano to Vesuvius. Cook was advised to adopt electric traction and metric gauge on the Puglia-Vesuvius route, with the cogwheel part reduced to 1.6 km on a total length of 7.7 km. 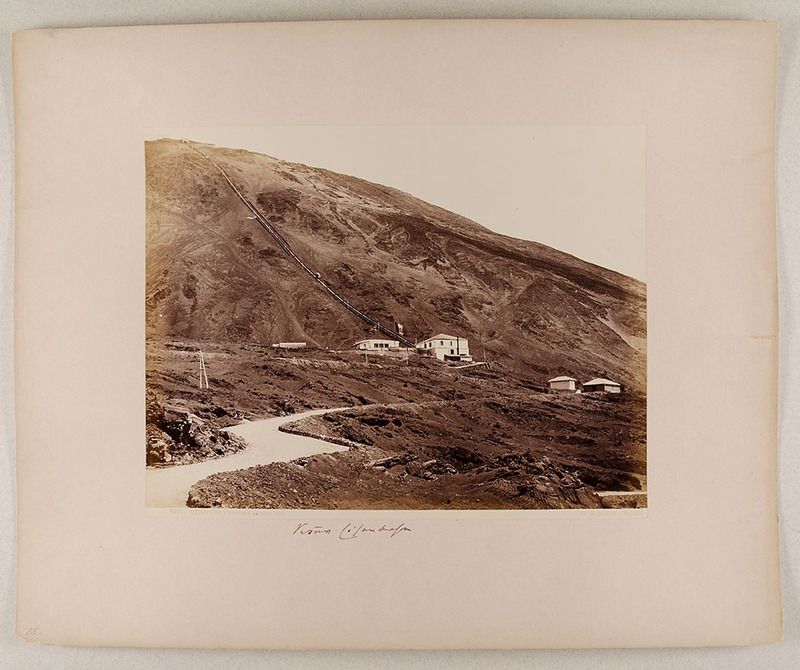 In 1902 work began at the same time as that for the Hotel Eremo, which would host tourists visiting Vesuvius. The inauguration of the new Ferrovie Vesuviane took place on September 28, 1903. In 1906 the eruption of the volcano caused considerable damage to the funicular and to the last section of the railway. During the reconstruction work, Cook extended the line from the old end at Olivi, over the Napoli-Portici-Torre del Greco tramway, to near the SFSM station of Resina. This new station, inaugurated on January 6, 1913, involved a stretch alongside the Circumvesuviana line up almost to Piazza Pugliano to which it was connected by a driveway. The two stations of Pugliano, ie the Circumvesuviana and Vesuviana were in the Piazza. 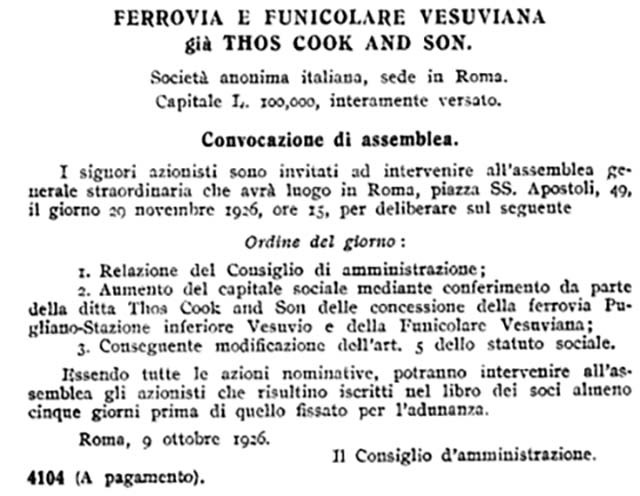 In 1927 the "Cook" ceded the concession to the Ferrovia e funicolare vesuviana Società Anonima Italiana. The further eruptions of 1929 and 1944 seriously threatened the railway, damaging some stretches of track, but they were not to jeopardize the existence of the plant. 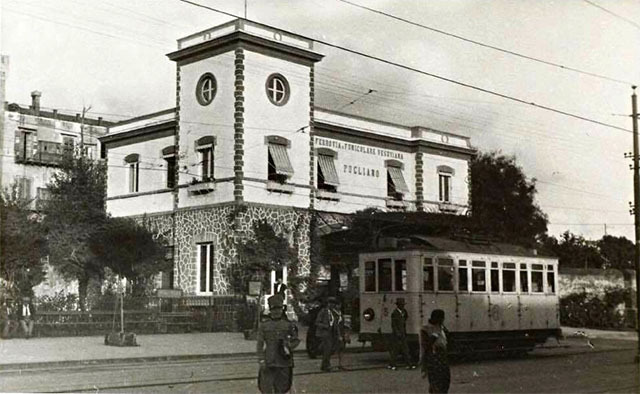 The low tourist movement caused by the war and the high running costs, forced the Compagnia Ferrovia e Funicolare Vesuviana to sell the plant, for 3,100,000 lire to SFSM in December 1945. Between 1946 and 1947 the SFSM management restored the destroyed sections and the tractors were able to return to the former valley station of the funicular, from which the crater was reached by a path. The reconstruction of the funicular, the adoption of the common 950 gauge with the Circumvesuvian network and the introduction of new rolling stock were not realized due to the excessive costs. In 1948, at the dawn of the car boom, it was decided to build a road to the old lower station and from there a chairlift. In 1951 the Hotel Eremo passed to private hands, more reachable from the following year thanks to the new road. By 1953 the improved road was complete as far as the Hotel Eremo-Observatory and the excursion coaches from Naples and regular bus from Pugliano could bring people to this point, where they changed to a shuttle train for the last 2,1 km until the chair lift. A rack locomotive pushed two cars, usually 6 and 7 up from the depot each morning and stayed at Eremo all day until the convoy returned home at night. In the autumn of 1955, the road was completed up to a thousand meters and the railway finally closed, with dismantling of the plants three years later. 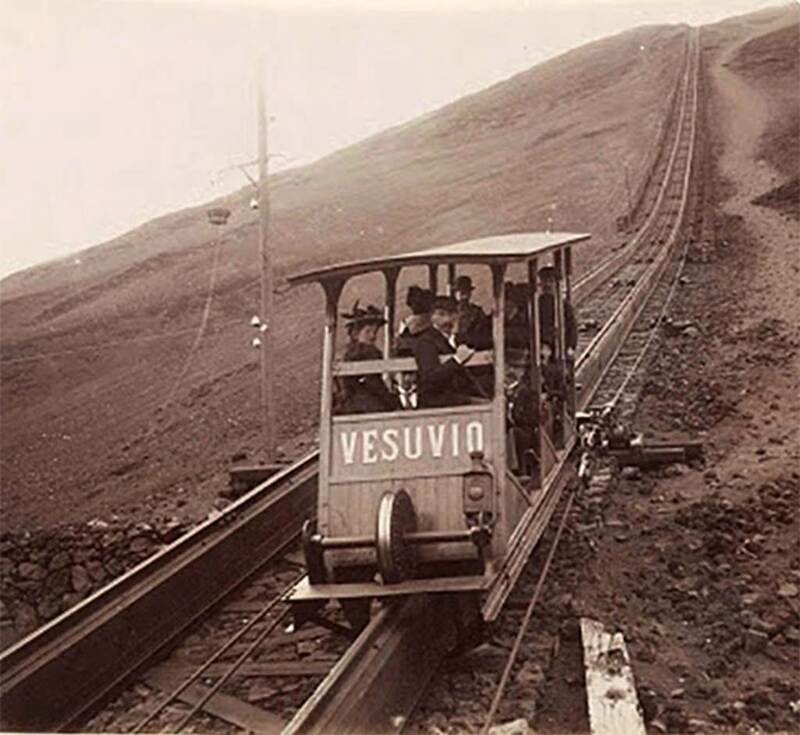 Vesuvius light railway. The starting station at Pugliano near Resina. Vesuvius, August 27, 1904. View of Vesuvius with newly opened electric light railway running across. An electric carriage and the cable posts can be seen on the line in the centre of the photo. Vesuvius to Pugliano railway. 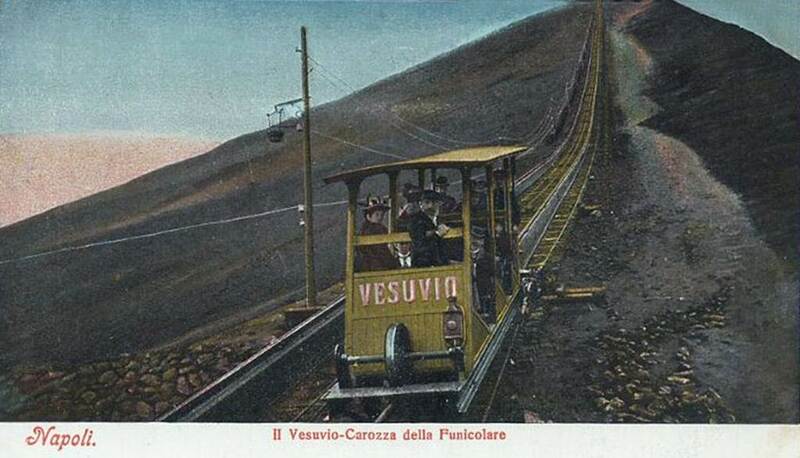 Old postcard with the title “Il Vesuvio con la nuova ferrovia elettrica”. “Vesuvius with the new electric railway”. The railway opened in 1903. It ran from Pugliano near the Resina mainline station to the funicular at Vesuvius. As a result of the railway there were double the number of tourists transported to the crater. Vesuvius to Pugliano railway. Old postcard with the title “Ferrovia Vesuviana Cook”, Cook’s Vesuvian railway. The electric train is pictured at the station of (Hotel) Eremo (and the observatory), the last stop before the Lower Station of the Funicular. Vesuvius light railway. The final station at Vesuvio Inferiore which joined with the funicular and later the chairlift to the left. This station was damaged in the 1944 eruption and never rebuilt. Vesuvius Funicular. Route of the light railway from Pugliano to the lower station of the funicular. Vesuvius light railway. Bus and shuttle train interchange at Eremo-Observatory. After the war the Thomas Cook Group sold the surviving plants to the anonymous company Strade Ferrate Secondarie Meridionali (SFSM) which in 1947 put it back into operation. The SFSM (later Circumvesuviana and later Ente Autonomo Volturno) to better manage the plant founded the Società Ferrovia e Funicolare Vesuviana. In 1953 the funicular was replaced by a chairlift. Between 1947 and 1961, the plant worked regularly transporting a thousand people a day to the top of Mount Vesuvius. On May 31, 1961, the Società Ferrovia e Funicolare Vesuviana changed its name to Seggiovia and Autolinee del Vesuvio S.p.A. always controlled by the then società Circumvesuviana. Vesuvius Funicular railway. 19th Century photo by Giacomo Brogi (1822-1881) no. 5231. Vesuvius Funicular railway. 19th Century photo by Giorgio Sommer (1834-1914) no. 2522. 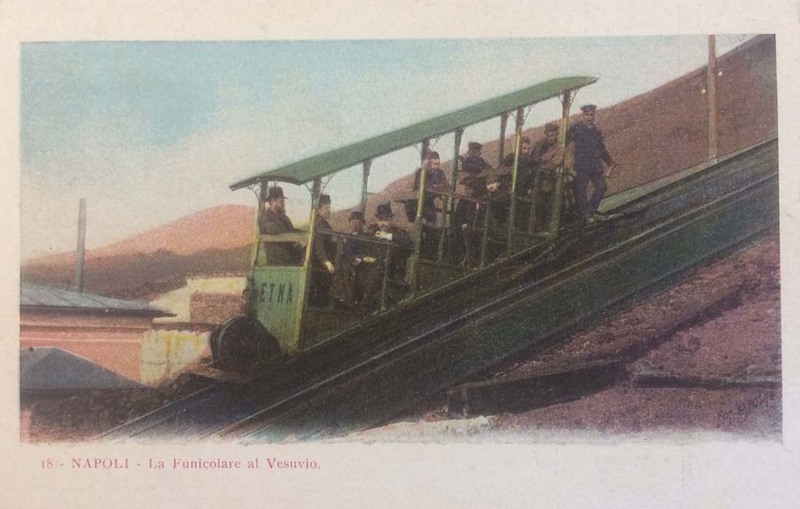 Vesuvius Funicular railway, c. 1890. Stazione Inferiore (Lower station) Photo by Giorgio Sommer (unnumbered). 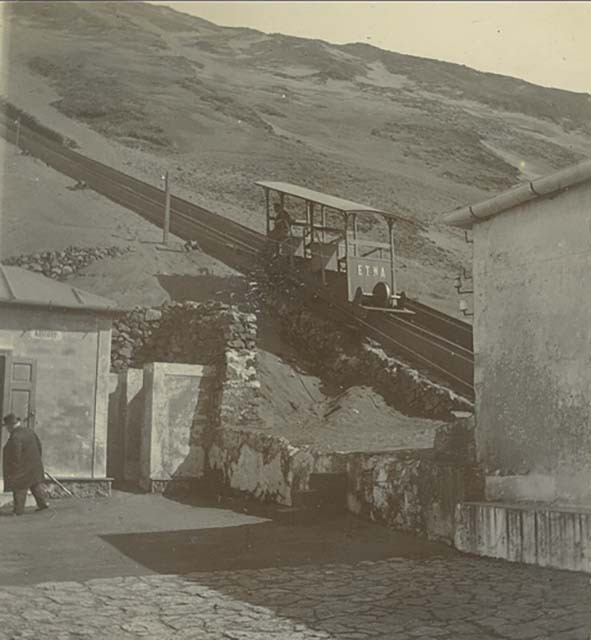 Vesuvius Funicular railway at the lower station in late 19th century. Stereoview photo by Giorgio Sommer. 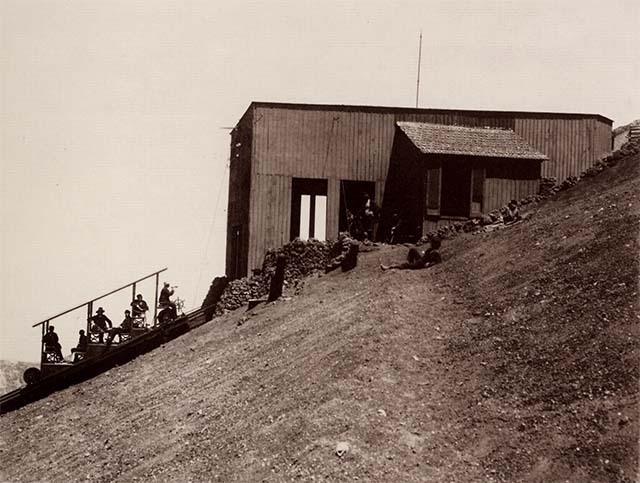 Vesuvius Funicular railway at the lower station c.1890. Photo by Giorgio Sommer. 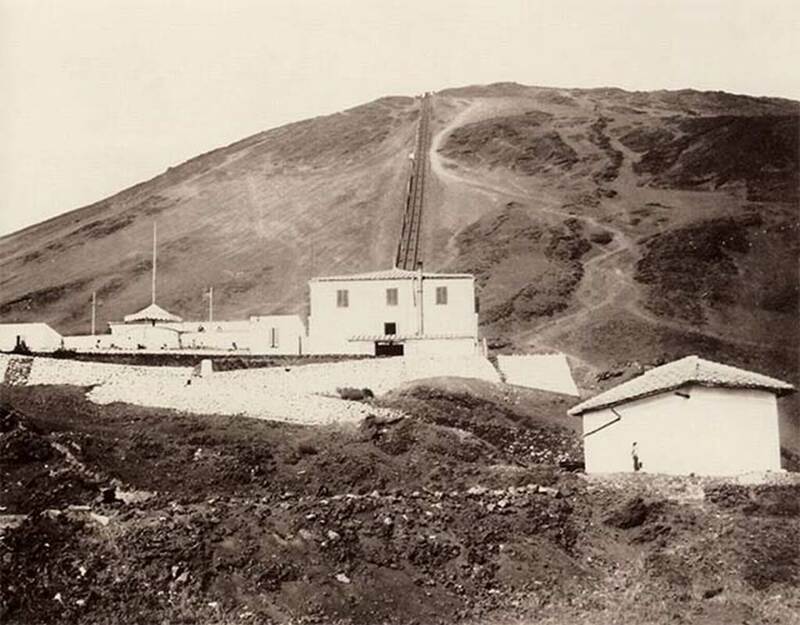 Vesuvius Funicular railway at the Stazione superiore, upper station, c.1890. Photo by Giorgio Sommer. From 1953 to 1984 the plant transported almost a hundred thousand people a year, of which more than half came from all over the world. With the passage of time, the chairlift became unsuitable for tourists, because it was often unusable due to the wind, which made the small seats dangling dangerously, and because it was unable to transport the increasingly numerous groups at the same time that they found easier to continue along the open asphalt road from 1955 up to the parking place at 1,000 meters. Sadly in 1984 the chair lift was also stopped forever. Vesuvius chairlift. The chairlift opened in 1953 and ran until 1984. Vesuvio Chairlift. Seggiovia ed Autolinee del Vesuvio (Chair lift and bus of Vesuvius) ticket (circa 1960s). A separate window will open, which you can make full screen if you wish. When finished watching close the window. Vesuvius postcard c.1940? Autostrada Vesuvio Boscotrecase presso Pompeii Scavi. 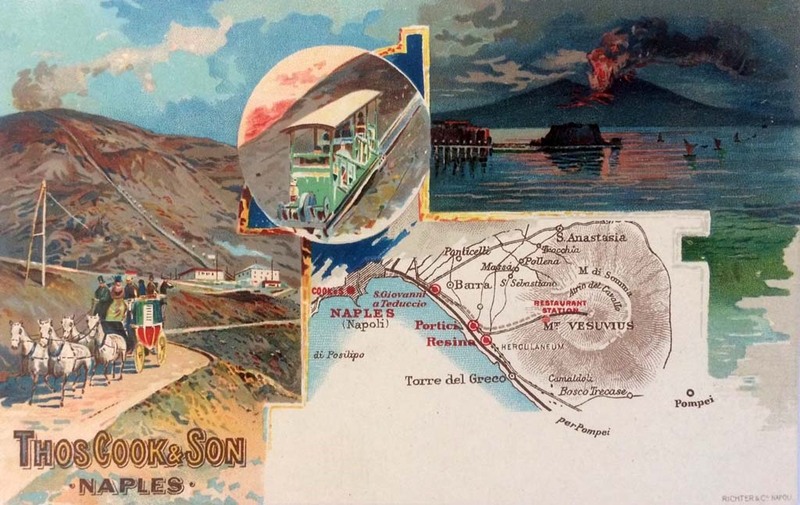 Pompeii is at the bottom of the postcard and the winding road to the summit of Vesuvius is shown. Vesuvius. Strada Automobilistica Vesuvio ticket (circa 1950s). Vesuvius car road ticket. Issued at Boscotrecase at a cost of 400 lira, presumably with 4% (16 lira) stamp duty. Note: It is forbidden to exceed 25 km per hour. Note: The company is not responsible for any damage during the journey to people or vehicles. The area around Vesuvius was officially declared a national park on June 5, 1995. The summit of Vesuvius is open to visitors and there is a small network of paths around the volcano that are maintained by the park authorities on weekends. There is access by road to within 200 metres (660 ft) of the summit (measured vertically), but thereafter access is on foot only. There is a spiral walkway around the volcano from the road to the crater.